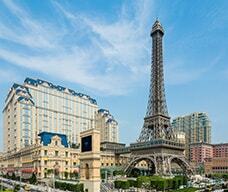 Located at The Parisian Macao, Eiffel Tower is approximately 162m high with 2 observation decks on 7th and 37th floor. Visitors can take the elevator to reach the top in just 40 seconds and enjoy a picturesque view of Macao and Cotai Strip. 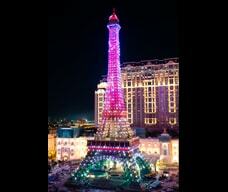 Eiffel Tower will be lightening up at dusk and is an ideal backdrop for visitors to take a remarkable photo. 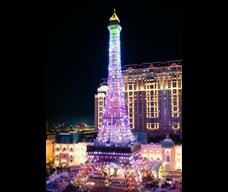 Accompanying various lighting themes and audio, 20 spectacular light shows are illustrated on Eiffel Tower each day.